Free segments can be found in the table of contents on each course’s page. Software architecture is a fast-moving, multidisciplinary subject where entire suites of “best practices” become obsolete practically overnight. No single path or curriculum exists, and different types of architecture—application, integration, enterprise—require different subject emphasis. And yet, year after year, “software architect” places in the top ten of most Best Jobs surveys. Keeping up with new approaches is challenging because you must maintain both technical depth and breadth. 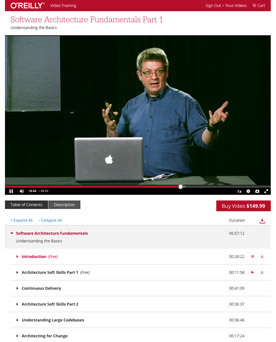 If you’re at the outset of a career as an architect or in the midst of such a career, the O’Reilly Software Architecture series provides you with a rich variety of topics, deep dives, innovative thinking, practical tips, and unfettered access to expert know-how that you can incorporate into a path that makes sense for you.